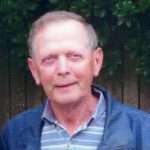 Steve was born in Prudhomme, Saskatchewan on August 15, 1939 and passed away peacefully at Kamloops Hospice on May 10, 2017. After graduating from Langley High School in 1958, Steve married Carol Bregg in 1962 and together had two children, Perry (Darlene) and Pamela (Phil) in April 1964. He worked at CIBC for 39 years prior to retiring in 1997 holding many positions in many towns and cities across BC and the Yukon. Steve’s family grew to 20 with grandchildren and great grandchildren, a wonderfully supportive and loving family. Steve was a member of the Kamloops Golf and Country Club for 20 years, and a Director there for four years. He was also a member of the MacArthur Island Curling Club for 18 years, holding various positions there too. He enjoyed golfing and camping, so we enjoyed many years with family and friends in trailers, fifth wheels and finally a motor home. He will be missed very much by all who knew him, but especially his family, of which he was very proud. Many thanks to Drake Cremation and Funeral Services for all their help, and to the wonderful care at Marjorie Willoughby Snowden Hospice; donations can be made there in Steve’s name. Carol, Pam and family. I am so very sorry to hear of your loss. Steve was a wonderful person, he was so very kind and thoughtful of others and one of the best credit and branch bank managers that I had the opportunity to work with, in my 25 years with CIBC. My thoughts and prayers are with you at this time.